Curls 101: NEW & IMPROVED for 2019! Hello, I’m Courtney. Thank you for visiting! There is A LOT to digest on this page, I know. 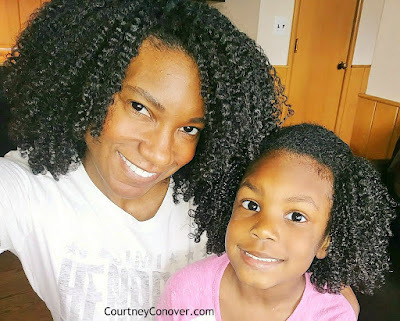 But please know this, I’ve been rocking my natural curls—exclusively—for over three years, and in this bog post I share every single lesson I’ve learned. You might ask what I’m getting out of this. Like, what’s in it for me, sharing all this info? Why am I doing this? Because I believe in helping, uplifting, and empowering others. Because when I first decided to embrace my curls back in the fall of 2015, I felt helpless and frustrated and all I really wanted was for someone with knowledge and experience to show me the way. Because after I’ve spent the majority of my life HATING my curls, I now have a daughter, Kennedy, who LOVES her curls more than anything, and the more women I help, the more my daughter—and other little curly girls—will see women who look like them…which will reinforce the need for all of us to love and accept our curls even more! The renowned Chicken Soup for the Soul book series—to which I’ve been a contributor since 2009—recently published the story of my and Kennedy’s “HAIRstory” in Chicken Soup for the Soul: The Best Advice I’ve Ever Heard, which is available in bookstores and on Amazon now. I’ve been approached with countless questions about my and Kennedy’s hair in the most random places—the check-out at Walmart, the drive-thru and McDonald’s, and while standing in line waiting for my kids to see Santa. I am so very grateful for each and every inquiry—and I am even happier for the opportunity to assist others on their curl journey. I spent the first 38 years of my life basically pining for stick-straight hair, and I’ve had long hair (anywhere between shoulder-length to tailbone-length) all my life. When I was a very young girl, my mother used to wash my hair, divide it into four sections, and then braid each section. By the time I was elementary school-age, I begged for her to blow-dry my hair because I wanted it straighter. 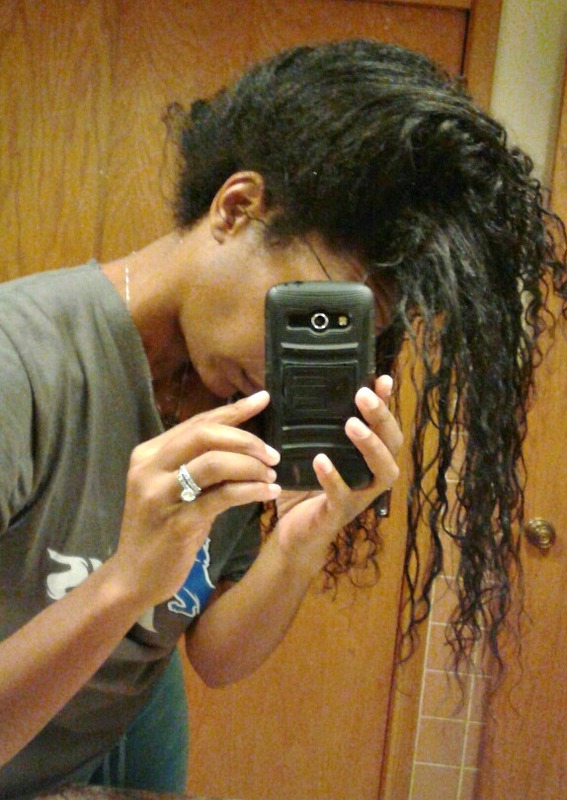 By late elementary, I wanted it even straighter, so I begged my mother to press it with a hot comb. By high school, that wasn't even straight enough, so I begged and pleaded for a relaxer. By age 25, I had had enough of scalp burns and running back to the salon to "perm" my new growth, so I grew out my relaxer. But the new obsession I would acquire would be nearly just as bad: I couldn't live without my flat iron. 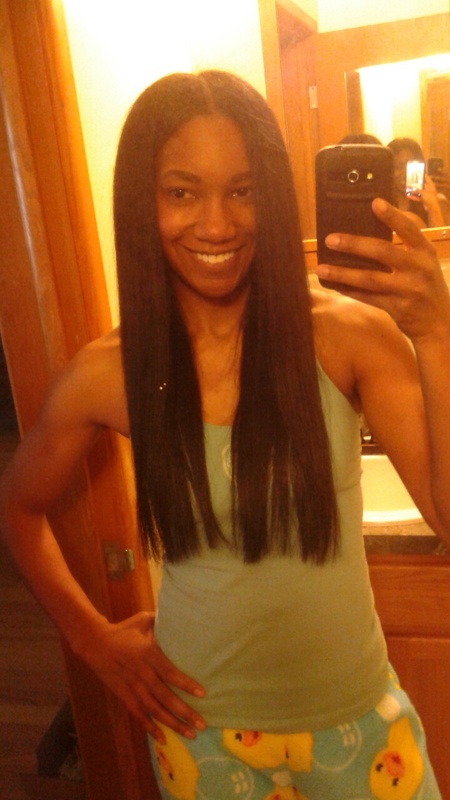 So, from age 25 to 38, I kept my flat iron permanently gassed up and ready to go at 480 degrees. The photo above was taken in March of 2015, and I would sooner gouge my eye out with an ice pick than consider embracing my hair in its natural state. In the fall of 2015 when Kennedy turned two, something occurred to me: Kennedy would soon call me a hypocrite...because if I thought her hair was so gorgeous, Why in the hell was I doing everything I could to make my hair the opposite of hers? And so, in November of 2015, I decided that I would stop flat-ironing/straightening my hair. I vowed that the next time I washed my hair, I would simply slap on some gel, let my curls air dry, wind up looking just like Kennedy (after all, we have the same hair type and texture), and go about my merry way. I would live happily ever after, I thought! Except that the opposite happened. I didn't understand why and how this had happened. 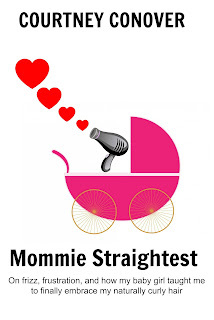 Come to find out, all the excessive--and oppressive--heat I had applied to my hair over the years in the form of blow dryers and flat irons, had permanently damaged my hair. I bolded, underlined, and italicized the two words above in an effort to convey the seriousness of what was going on above. This means that no product, method, or cure could undo the harsh beating my hair had endured as a result of the continuous heat I had subjected it to. Think about it this way: Remember those phones we used to have on the kitchen wall back in the 70s and 80s? The ones with the long, spiral phone cord? What happens if you keep stretching that phone cord over and over and over again? Over time, the cord's perfectly even spiral shape will eventually become straight in some parts, and tangled in other parts. Better yet, picture one of those plastic or metal Slinky toys from our childhood. Remember how a Slinky would lose its shape and it would never bounce the same? Once that happens, there's nothing we can do to reinstate the cord's or Slinky's original spiral shape. That's exactly what happens to heat-damaged hair. When you become a victim of heat damage, the only remedy is to cut it off and patiently wait for new growth to arrive. I didn't "big chop”—that’s the natural hair term that refers to cutting off all your hair at one time. Instead, I transitioned. Over the course of 17 months, I trimmed of an inch here and an inch there, wore a ton of hats, and acted as if I already had the curls I had been waiting for. 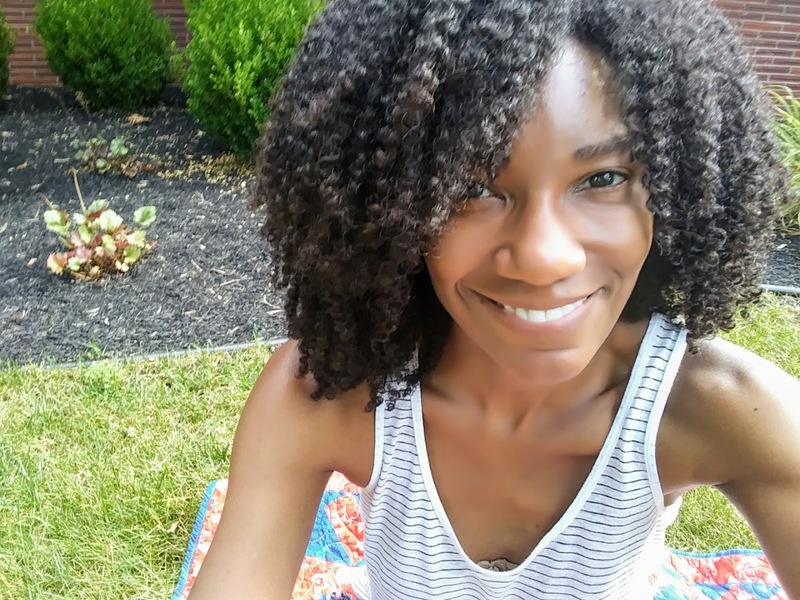 I'm not going to sit up here and feed you candy and tell you lies: Transitioning from heat-damaged hair to the healthy, voluminous curls you see in the photo at the top of this blog post was no fricking joke. It took nearly two years. And, at times, I felt like quitting. 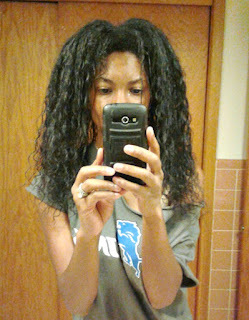 But, now, looking back, going natural was hands-down, unequivocally one of the best decisions I had ever made. My only regret is that I didn't do it sooner. I needed help. Real help. And no matter where I looked, I couldn't find it. I used to lay in bed at night with my laptop watching countless wash 'n go tutorials on YouTube. I would then scurry off to Target, Sally Beauty Supply, or the nearest beauty supply store and plunk down $25 here, $60, $45 there...in hopes that my hair would turn out like the women in the videos. The only thing I succeeded at was basically going broke and growing more despondent. It wasn't until about one year into my hair journey that I finally figured out what the hell to do. And when I did, I vowed right then and there that I would someday help as many curly girls as I could. My Best Advice for The Best Curls. So, here's the point in this blog post where things get good because here are the curl commandments I've come to live by. 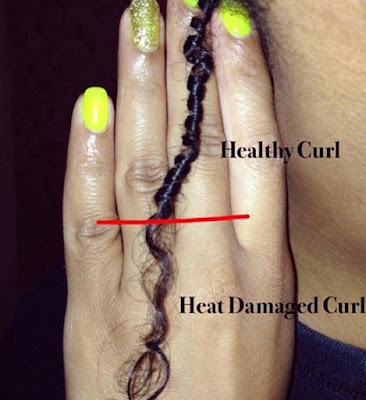 Do you want healthy curls? Do you really, REALLY want them? 1. STOP STRAIGHTENING YOUR HAIR. The photo above is just one example I found on Instagram. But, trust me, there are others that are even worse than this. It begs repeating: There is nothing this woman can do to restore the heat-damaged portion. Nothing. Just trust me on this one. Each and every time you take a flat iron to your hair it's like playing Russian roulette. 2. WATER = LIFE FOR CURLS. IT'S THAT SIMPLE. 3. SAY NO TO OILS, SILICONES, AND BASICALLY ANYTHING THAT COATS CURLS. Now, allow me to state for the record that there are curly girls who use products with coconut oils, shea butter, or other oils, and they claim their curls are just fine. And if you are one of those curly girls, more power to you. But you should also know that if you are a curly girl who is less than pleased with your curls, just know that silicones and oils may be the reason. This is a tough pill for many curly girls to follow, particularly African-American curly girls because we have been culturally conditioned to believe our hair needs "grease" and oils. It's just what we've always been told. 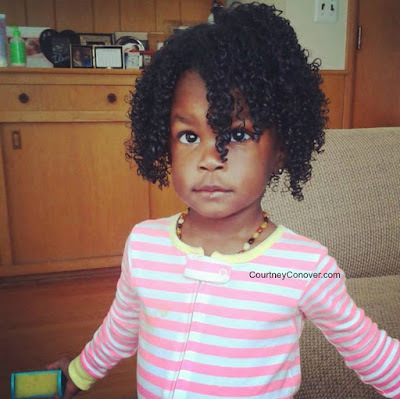 We've been programmed to think about hair in terms of race instead of science. Somewhere along the way, we've been taught to believe that those oils and butters provide moisture for our hair. But if we stopped to think about it...could that really be possible? No. Picture this: If I wrapped my arm in clear Saran wrap and then dunked it into a tub of water, is my arm really getting wet? Nope. It looks like it's getting wet, but the Saran wrap is acting as a barrier. This is essentially what happens when your hair is suffocating under four layers of coconut oil or shea butter. This is why curls are dry: Water can't get past the butters and/or oils. This commandment is the combination of 2 and 3 above. When lots of water and lots of conditioner are applied to the hair simultaneously, oooohh, la, la. Bliss! People often think that conditioner is the product that conditions the hair, and while that statement isn't false, it doesn't present the entire story. Think of it this way: Conditioner is actually the vehicle that allows water to penetrate your hair. It's almost as if conditioner is the car that delivers water to its destination, aka the center of each hair shaft. The only potential roadblock is if the conditioner contains something called silicones. A silicone is an artificial ingredient used in many conditioners for the purpose of making hair appear shinier and healthier than it is. The problem with this is that, like, oils and butters, the vast majority of silicones coat the hair and prevent water from getting in. In fact, silicones (like oils and butters) have a tendency to build-up on the hair over time, and that can really spell disaster. So here's the point: Look for silicone-free conditioners. And how do you identify a silicone in a list of ingredients? Look for any ingredient ending in "-cone." The higher up the silicone is in the list of ingredients, the heavier the concentration of that particular ingredient. And here's the real kicker: Silicone-free conditioners do NOT have to be expensive! I ONLY use silicone-free conditioners on my and Kennedy's hair. I rotate between three of them, in fact. And guess what? All three of them cost under $5 a bottle. My current favorite is Vo5's Strawberry Moisture Mils Conditioner ($.97 at Walmart, baby!) and Trader Joe's Tea Tree Tingle Conditioner, which is $3.99 at Trader Joe's (a word to the wise: DON'T buy this on Amazon.com because you will find that it'll cost 4 x as much!). Also, I think it is only appropriate for me to take a moment to answer the #1 question I get almost daily: What products do you use on your hair?!? But, before you run off to the store to grab everything I mention in the video above, please, please, PLEASE do the following first: YOU NEED TO CLARIFY YOUR HAIR! What is that, you may ask? Clarifying is another term for deep cleansing; it's like wiping the slate clean and pressing the reset button on your hair. Here's the thing: Before you can begin using the regimen I describe above, FIRST it is imperative that you get all the layers of "gunk" and build-up which may already be on your hair. Because if you've used oils and/or products containing heavy butters or silicones (Please re-read the section above about my arm and Saran wrap), then my method is not going to work due to the layers of build-up covering your strands. 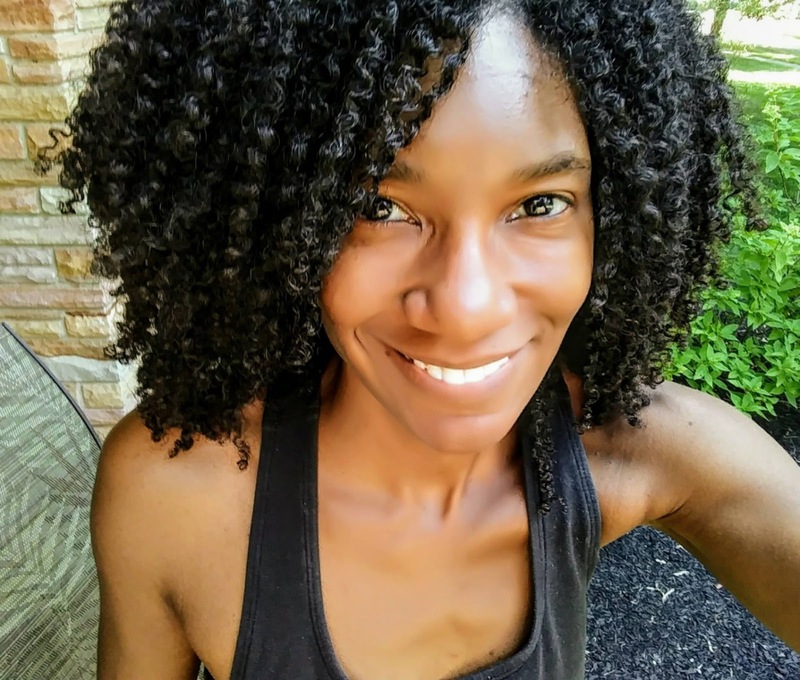 Normally, I don't use shampoos with sulfates because sulfates are extremely harsh ingredients that, if used regularly, can strip and dry out hair--especially curly hair--over time. (Again, you'll notice that the shampoo I mention in the video above (Trader Joe's Tea Tree Tingle Shampoo) is sulfate-free). I do clarify my hair three times a year with a sulfate shampoo to perform a really deep cleaning on my hair and keep build-up at bay. The sulfate shampoo I recommend is Suave's Naturals Daily Clarifying Shampoo. It's cheap (under two bucks), found at nearly every drug and grocery store, and it does the trick. I know all of the above is a lot to digest. In an effort to not make this blog post any longer than it already is, I'm going to leave it here. But, just trust me on all of this. It has worked for my daughter and me, and it will work for you. For more details on things like the complete list of products I use, how I preserve my curls while I sleep, and other tips, please visit my YouTube channel here, and click on the VIDEOS link at the top. And for more curly hair information and conversation, please visit our closed Facebook group, Courtney Conover's Naturally Curly Love Lounge. My mornings—particularly weekday ones—are crazy. But…isn’t that the case for us all? Between getting the kids ready (as well as myself) all while racing against the clock to ensure that we’re not late for school drop-off, I simply can't spend oodles of time on my hair. Enter my (now not so) secret weapon: My dreadlock cap. No lie, this swath of fabric is my lifesaver. In this video below I demonstrate how—in real time—this cap takes center stage during my nighttime routine and protects my curls so that they’ll remain intact in the a.m. If you are not able to view or click on the video box below, please click here. Also, it's a damn good thing I didn't lose my balance in headstand because my stick of sandalwood incense was, like, *super* close to my feet. Whew. If you are not able to view/click on the video box below, please click here.